This Book of Memories memorial website is designed to be a permanent tribute paying tribute to the life and memory of Richard Valencia. It allows family and friends a place to re-visit, interact with each other, share and enhance this tribute for future generations. We are both pleased and proud to provide the Book of Memories to the families of our community. Richard E. Valencia aka Rick(y) or Ricky Bobby suddenly passed away at home Thursday, October 25th, 2018 at the young age of 44 years old. He was born November 20, 1973 and raised in Torrance, Ca. Rick resided in Lake Elsinore, CA for the past 11 years where he helped with taking care of his parents and made many, many friends. During this time he found his passion for cooking and enjoyed sharing his foods he prepared. In fact this is what he was doing when he suddenly felt ill. At the time he passed, Rick was employed at Ponte Vineyard Inn in Temecula, Ca for the past 4 years. 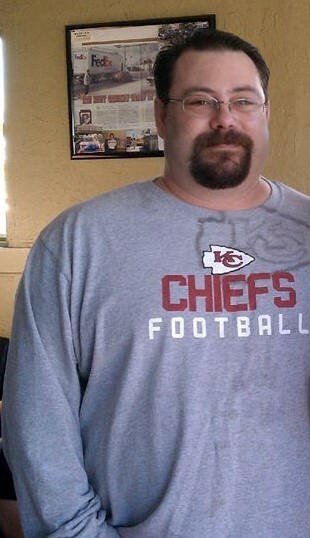 Rick was an avid Star Wars fan and Kansas City Chiefs fan probably since he could say the words. He also loved video games and watching movies. His parents' dogs enjoyed his love, Mandy and Mindy who have crossed the rainbow bridge but Chloe is missing him! Survived and greatly missed by father Dan aka 'Peanut Dan' Valencia, brother Corey Rice (Roy Mitchell) of Los Alamos, Ca, sister Linda Riggle (Bob) of Sacramento, Ca and their children David and Amber. Daniel aka 'DJ' Valencia (Grace Johnston) of Redway, Ca. and their children Andrew, Brooke and Claire. Also niece Cathy Bishop of Sacramento. Proceded in death by his mother Carol and sister Nancy Bishop. Family and friends are invited to the Celebration of Life which will be held Saturday, November 10th, 2018 @ 3pm. The Riverside Bar & Grill, 31502 Riverside Dr, Lake Elsinore, CA 92530. Food will be provided and everyone is encouraged to bring photos, stories and memories. Ecclesiastes 3:1-8-There's a Time for Everything. 4)A time to weep, a time to laugh, a time to mourn, a time to dance.